There are 32 responses to “Enable/Disable Trackpad on New MacBook”. Hi Timur, I’m glad that you thought the post is useful. Though I don’t know Russian, you can take the post you like, with the backlink is ok.
hej Tkjune, thanx for the solution, i had the same probs as you. Do you know the Terminal input for horizontal scrolling? I disabled this too on my iBook and know can’t enable it again. Great post, would you mind expanding on the topic a bit in the future? So frustrated and angry – reminds me of my PC days. Did exactly what you said and STILL cannot disable this bloody trackpad – I HATE IT!!! I HAVE A MACBOOK PRO – what can I do? The disable trackpad button has been moved to System Preferences/Universal Access/Mouse & Trackpad!!!!!! @Mary Thank you. It may be part of 10.6 updates? Actually, I checked Universal Access before 10.5.7, and it wasn’t there. In that case, I could update this blog. Thank You, Thank You, Thank You! Having the trackpad mess me up all the time was maddening, as was not being able to find out how to turn it off. Thanks so much!! Fantastic! I was fiddling with keyboard and trackpad options for hours, and the guys in my computer shop were clueless. Now one click in the Universal Access and problem solved. I want to thank you for a very informative post. I have been having issues with the trackpad on my MBP. I wanted to disable the trackpad until I could find a resolution to my problem. Your post really helped me out a lot. I would never have figured out where the option was to disable the trackpad! Thanks again!! Where else can I read about this? Tnx guys. Your awesome. Searched the whole web. And then You come with clear pictures, so cool. I can happily type now, without getting into anxiety about touching my mousepad. Tnx. Happy new year. Tkjune, I looked all over for this option and couldn’t find it. Then I found your post and realized they moved it under Universal Access. I think it would have been OK to put it in under Trackpad, and Mouse sections as well. They put the mouse stuff under Trackpad so go figure 😛 Anyways, thanks for the tip! @A-Double Great to hear that it’s been of help. And since Lion has come, have u upgraded? This tread saved my life, thank you very much! no more crazy cursor & automatic right clicking! BTW Apple needs to resolve this! Macs are too expensive for this kinda crap! There is noticeably big dollars to comprehend this. I suppose you have produced specific nice points in functions also. you, sir, are the man! thank you! @Tkjune; Thank you! It’s really useful, I have a MacBook (late 2007) and the hand rest on right side of it is broken! sometimes my trackpad make some problems because of this! NOW when I disable the trackpad it’s gone! @Mohsen Jafari Malek, That’s nice:) I’m glad it helps. YAYYY – thanks for teaching me about universal access and being able to shut down trackpad while I have a mouse attached! I was about to go nutzo. My damn trackpad would click when my palm put too much pressure anywhere RIGHT of the trackpad – WAY away from where it should be clicking. I could even reproduce it by pushing with one finger, like in the middle of the space, in line with the up and down arrows. Crazy, man, crazy. 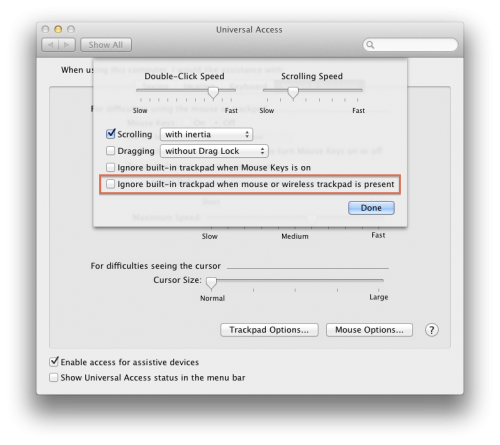 I’ve got the same problem everyone else has had – I can’t disable the trackpad when a mouse is installed. I’ve checked in Hardware>Keyboard and Mouse, Hardware>Trackpad and System>Universal Access>Mouse & Trackpad and nowhere does and option to Ignore trackpad when mouse is present. 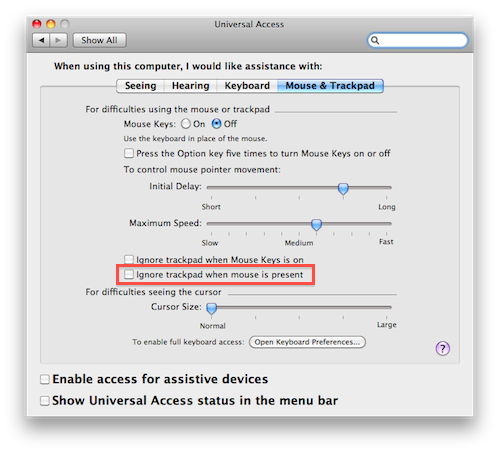 Universal Access has Ignore trackpad when mouse keys is on but not when mouse is present. I have Mac OS X, Version 10.5.8.